The Soprano Iva Ionova was born in Veliko Tarnovo (Bulgaria). Between 1991 and 2003 she studied at the “University of Music” in Sofia, at the “University for Music and Art” in Vienna and with Prof. KS Siegfried Jerusalem at the “University of Music” in Nürnberg. Since Oct. 2007 Iva Ionova has studied with M. Mirella Freni at the CUBEC “Centro Universale del Belcanto” (Vignola, Italy). During her studies Iva Ionova participated in several master-classes, among others with Prof. Margarita Lilova, Prof. Edith Wiens, Prof. Sylvia Geszty, Prof. Claudia Eder, Prof. KS Siegfried Jerusalem and with baritone Thomas Hampson. She made her debut in June 1995 with the role of Bastienne in “Bastien und Bastienne” (W. A. Mozart), performed with the “Münchner Philharmoniker” in Munich. Iva Ionova has taken part in many competitions and she has been the recipient of numerous awards. In May 2008 she won the First Prize in the “First International Singing Competition” in Vienna. She also won the Third Price at the “First International Competition for Operetta and Musical” in Sofia (1997), a Special Price at the “16th International Erika Köth Master-class” and the Special Price at the “First International Competition for Operetta Heinrich Strecker” in Vienna (2001). She was finalist of the “15th Competition for Operetta Nico Dostal” in Vienna (1999), of the “International Competition for Opera” in Malibor, Slovenia (2001) and of the “8th International Competition Ferruccio Tagliavini” in Deutschlandsberg, Austria (2002). In 2006 she was the recipient of the Special Award for Young Singers and artist at the Meiningen Theatre (Germany). In 2009 she received the Award for Special Member and Artist from the Meiningen Theatre. Iva Ionova sang at the international festivals in Aix-en-Provence (France), in Helsinki (Finland), at the “Wiener Festwochen” and at the “International Baroque Festival Ambronay” (France), International Mozart Festival in Premeno (Italia), International Summer festival in Cortina (Italia). She worked together with orchestras such as the “Münchner Symphoniker”, the “Rheinland-Pfalz-Philharmonie”, the “Niederösterreichische Tonkünstler” and with conductors such as Zubin Metha, Alexander Briger, Rinaldo Alessandrini, Peter Falk, Fabrizio Ventura, Michele Brescia. Iva Ionova has experience with stage directors such as Christine Mielitz, Philiph Stölzl, Sebastian Baumgarten, Andrea Moses. Her repertoire includes Konstanze in “Entführung aus dem Serail”, Pamina and Erste Dame in “Die Zauberflöte“, Fiordiligi in “Cosi fan tutte”, Donna Elvira in “Don Giovanni” (Mozart); Musetta and Mimi in “La Bohème” (Puccini); Emmy and Mrs. Wordsworth in “Albert Herring” (Britten); Luci in “The Telephone” (Menotti), Schopfhenne, Specht and Gastwirt in “The cunning little vixen” (Janácek); the title role in “La Calisto”, Leonora in “Il Trovatore“, Agathe in “Der Freischutz”, Mimi in “La Bohème”, Arminio in “Arminio” (Fr. 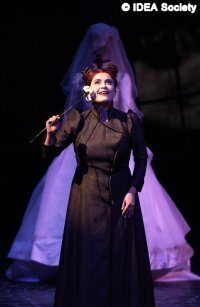 Rinaldi), Cio-Cio San in “Madama Butterfly” (Puccini). Since 2002 she has been employed as a soloist at the Südthüringisches Staatstheater Meiningen. Here she also sang in the roles of Alice in “Falstaff” (Verdi), as Valencienne in “Die lustige Witwe” (Lehár), Geist in “Grenzfälle 1 – Infinito Nero” (Sciarrino/ Schütz), Gabriel and Eva in an opera-production of “The Creation” (Haydn), Jano in “Jenufa” (Janácek). She sings Elettra in “Idomeneo”, Juliette in “Der Graf von Luxemburg” (Lehár), Julietta and Antonia in “Hoffmanns Erzählungen” and Hermia in “The Fairy Queen” (Purcell), Donna Elvira in “Don Giovanni” (Mozart), Leonora in “Il Trovatore”, Ännchen in “Der Freischutz”, Mimi and Musette in “La Boheme”, Arminio in “Arminio” (Fr. 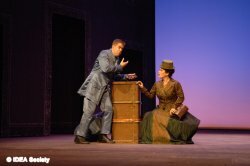 Rinaldi), Cio-Cio San in “Madama Butterfly”(Puccini). Iva Ionova is especially interested in baroque music. She was introduced to the American public by the broadcasting company “The Voice of America” within their documentary series “The Voice of the Future”. As a concert singer she also has a large repertoire including works by Bach (Magnificat, Kantate No. 12, Johannes-Passion, Matthäus-Passion), Haydn (The Creation), Mozart (Exultate Jubilate, Requiem, Krönungsmesse), Beethoven (9th Symphony) Pergolesi (Missa romana, Stabat mater) Schubert (Der Hirt auf dem Felsen), Brahms (Requiem). She gave concerts in Belgium, Bulgaria, Germany, Finland, France, Japan, Serbia, Slovenia, Macedonia, Canada, Hungary, Spain and Austria. For the Bavarian broadcasting company she recorded songs by Brahms and Schubert. In December 2008 she sang Oxana in “Christmas Eve” in Sweden with the Norrköping Symphony Orchestra (conductor Alan Buribayev) to great critical acclaim. In February 2009 she sang in Mendelssohn’s “Elias” with the National Bulgarian Symphony Orchestra at the “Bulgaria-Hall” in Sofia. In 2010 Iva Ionova will sing “Italian concerts” and Lisa in “Das Land des Lächelns” together with Siegfried Jerusalem. es ist mir eine Ehre und ein Vergnügen, die hervorrangenden professionalen und vokalen Eigenschaften von Frau Iva Ionova, Sopran, bestätigen zu dürfen. In zahlreichen Engagements auch von größter Schwierigkeit hat sie immer ein beträchtliches professionelles und künstlerisches Aplomb erwiesen."